Exclusive to Target, 2015 Topps Heritage Football 60th Anniversary Autograph Edition goes with a retro design and multiple generations of NFL players. Each box includes one autograph. The 100-card base works with the 1956 Topps design and includes former greats, current stars and key rookies like Jerry Rice, John Elway, Andrew Luck, Odell Beckham Jr., Eddie Lacy and Marcus Mariota. Parallels include Foilboard (1 per box), Black Border (#/56), Gold Border (#/5), Red Border (1/1) and Printing Plates (1/1). Autographs drop one per box and add a sticker to the base design. Most of the base subjects are included in the autographed parallel. The signed cards also come as Black Border, Gold Border and Red Border parallels. The retail-exclusive product is only available at Target. Austin Hill Auto RC 2015 Topps Heritage - Ships FREE! 100 cards. Card #53 not listed on checklist. Shop for base cards on eBay. Is this product being delayed? I keep checking my local Targets and no dice. I have seen maybe 3-6 singles on Ebay. David B � Retail products always end up having an inconsistent release and it is clearly out in some places since they are showing up online. I imagine it will start popping up a lot during the next week or so. $24.99 per box at Target. It seems as if this product is a glorified version of the 2015 HIT set, in that the autos are mainly rookies – most of whom aren’t even in the NFL at this point. Still, I’ll but a box to check it out (if and when Target releases them), but more than likely will get a Cody Fajardo or Bo Wallace auto, along with some relatively lame toss-in’s. This seems like a long run for a short slide. This product was poorly made, and cost $27.00 per pack. out of 5 packs what I got was garbage. Topps have awesome products most of the time, this one is not one of them. One of my auto stickers was not put on very well and was ready to fall of. The rookie crop was not impressive, and the product took 9 days to hit the shelf. G Lash – You’re 100% correct – I had a coupon for $3 off, but the set was still bicycle spoke fodder for over $20. Best bet is to buy Topps base set and send the cards to the players for signatures – got both Mannings, Brees, and about 100+ other players to respond. The base packs are about $2 each. two stamps and two envelopes about another $1 – so for about $3 you can get lucky. Luckier than if you spent $20+ for the Heritage set – Topps needs to fire the team that came up with this product! This is not a good product. I understand that this is Topps 60th Anniversary for football cards, but why use the 1956 design when that’s already been done. The 2001 Topps Heritage used the same design and they’re more closer to the original than these. The backs on the 2001 Topps Heritage have player stats and a question and answer with a small picture like the 1956 cards. The backs on these cards lack both of these things. The sticker autos and the card backs make this set look like it was thrown together at the last minute. It’s definitely not worth $24.99 for 11 cards. If this is going to be the last year Topps does NFL licensed football cards, why not go out with a bang? 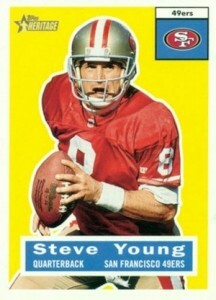 The set could have been much larger and used multiple border designs from all the years Topps made football cards. Something similar to the 2013 Topps Archives set would have worked well in my opinion. I like the design of this product. Im not fan of the sticker auto of course. They would have been way better with on card autographs. I don’t like big sets so the hundred card checklist is cool with me also and they didn’t get carried away with the parallels. Not a bad value especially for retail. Guaranteed auto for $25 and a chance at some big names. I’m sold! I pulled a Beckham gold auto (#3/5) from my first box and kind of got hooked. Since then, it has been all unestablished rookies for autographed cards. The set is very rookie heavy which can lead to speculative purchasing. It’s almost like gambling at $25/box. I’m not wild about the design, but what else were they going to use for an anniversary set? By the same token, the Topps Football Archives set from a couple years ago showed that not all of their design choices are the best. (1985? I sat out that year because the cards were so ugly. It took 1986’s design to bring me back if only for a year.) All in all, not bad, but could have been better. Probably best off buying the complete base set. It will probably be $50 or less in a year or two. First and foremost, anyone complaining about the “style” of the product obviously is forgetting what they’re buying. HERITAGE = throwback style. I.e. Boring card stock and styling reminiscent of a previous set. So on that level, this set is pretty much on par with every other Heritage set. Autos- I only bought one box and got an Ameer Abdullah autograph that appears to sell for almost exactly what I paid for the box, which is a super huge plus for the on lottery box I bought, BUT, it’s a sticker auto and I’m well aware that I hit one of the better speculative rookies in the set. Price- Price is totally subjective, but I’m of the belief that $24.99 for a box of cards (even WITH an autograph) is pretty darned expensive. I’m not mad about the one I got, but at $25 an auto, they should be on card (and possibly even all autographs serial numbered). It’s probably closer to a 3.5 star product than a 3, but otherwise, I’m a little unimpressed. Sure, it didn’t “disappoint” because I know what to expect from “Heritage” but this is supposed to be a “Special Anniversary Edition” and it didn’t really feel all that special. If you travel to the North East United States you see homes that are “American Heritage”- that’s a ceritan style. Older design , but the paint is fresh and crisp, the shutters secure, and the home solidly constructed. That’s the mental image I had when purchasing this set, retro design presented in a solid, crisp manner. Unfortunately the set does not live up to this concept. Rather, like an older home that has not been perfectly maintained, the paint is thin, and the materials have aged. Nice idea, not well executed. Yes the sticker Autos are not my favorite butbfir the price point, there really aren’t better deals. 5 boxes yielded a Mannion Black auto /56, Steve Young Good Auto /5, Jamison Crowder RC Auto, Josh Harper RC Auto and one other. Plus the base cards sell high on EBay and the SPs sell crazy high. Even if you get a dud box put the lot on EBay and you will pull at least 15 bucks back. $25 for one Auto isn’t bad. You pay $70 for chrome with one Auto, $100 for Supreme and you may get a crap patch… All in all this product carries good value. Just bought 1 box and threw it in the trash. just a worthless josh harper auto. I like the cards and the small set size. I’ve bought 7-8 boxes and all the autos I’ve received are junk. I may be the only one in this area who has bought these boxes as there are still a ton of them on the display rack at my local target. That’s a pretty good indication that this product has been unpopular. 25 bucks is a lot to ask for what you get. Target Cartwheel App now has them 45% off, seems like they are not selling….may be a good time to pick one or two up for $13.74 each.